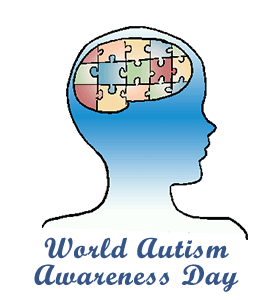 ﻿World Autism Awareness Day: Calendar, History, Tweets, Facts, Quotes & Activities. World Autism Awareness Day seeks to raise awareness of the autism spectrum disorders and improve the lives of those currently living with autism. Autism refers to a lifelong brain development disorder that affects social interactions, learning, routines and communication. It is estimated that approximately 1% of the global population is autistic. World Autism Awareness Day was designated by the United Nations in 2007 in an effort to end stigmatization and discrimination against those with autism. World Autism Day is celebrated annually on April 2nd and fits in with the UN's Agenda for Sustainable Development, which promises to leave no one behind. The theme for World Autism Awareness Day 2018 was Empowering Women and Girls with Autism. Autism now affects 1 in 68 children and 1 in 42 boys. Boys are 5 times more likely to have autism than girls. 35 % of young adults (aged 19-23) with autism have not had a job or received postgraduate education after leaving high school. Who do you think made the first stone spears? The Asperger guy. If you were to get rid of all the autism genetics, there would be no more Silicon. – Temple Grandin, world-renowned Autism spokesperson and university professor. Wear blue in order to support World Autism Day. The color blue is internationally recognized as a symbol of support for World Autism Day and it is accompanied by the catchphrase wear blue, April 2. Watch a movie about autism such as Fly Away , Sounding the Alarm and The Story of Luke . Light up your home or your business in blue like many famous buildings or monuments worldwide. There are many ways you can do this. It can be as simple as putting blue plastic over floodlights to project the color blue on your home. You can also use a blue Phillips light bulb, which can be bought at Home Depot. Get active on social media by taking a picture of yourself wearing blue and posting it using the hashtags #LIUB (Light it up Blue), #WorldAutismAwarenessDay, #WAD and #autism. You can also turn your profile photo blue on social media by putting a blue frame over it. Take part in an Autism Speaks Walk that raises money for the cause. You can gather a team and walk in support of someone you know with autism or simply donate, walk and enjoy the day with thousands of others.